Physical Education is taught across the school by the class teacher or by a school based specialist P.E. coach. All pupils receive two hours of P.E. each week, this includes one hour of swimming for year 5. Pupils learn about being healthy, they learn skills which they can apply to a sport, rules of a sport, being safe, competing, learning about their bodies and participating in a range of sports. A requirement from the National Curriculum is for pupils to take part in competitions. We allocate time for all pupils to participate in healthy competition either against their peers, other classes, schools or against their own personal scores. Pupils have an opportunity to improve their skills and knowledge of different sports by joining after school sports clubs which are delivered by our specialist coach, Jakir. Jakir also spends time in each playground daily, playing a range of sports with all the pupils. At the beginning of each term, pupils are assessed in P.E. by completing a range of organised fitness and skill-based activities. 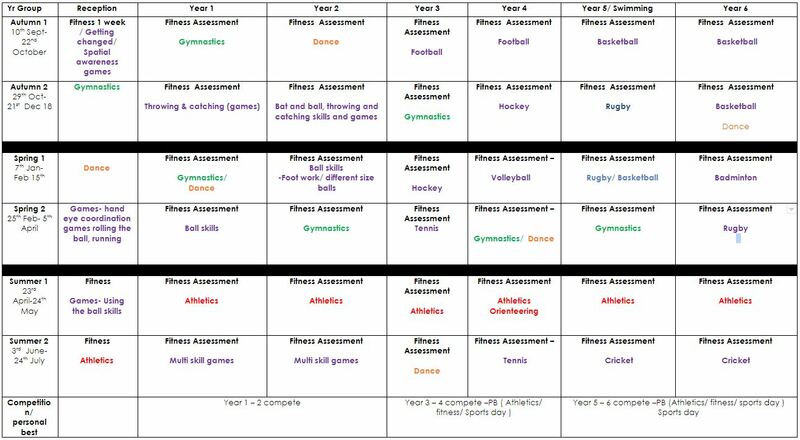 Scores from each activity are recorded and each term the assessment data is analysed to plan activities to help increase fitness and skills.